Donald Cantley Stafford was born 3 January 1941 in Beckley, West Virginia. Don joined the Army in January 1958 just after his 17th birthday. He went through basic training at Fort Knox, Kentucky and on to Advanced Infantry Training at Fort Dix, New Jersey. After AIT he was assigned to Fort Bragg, North Carolina where he underwent training as an Army Paratrooper. He served with Co. E 504th Parachute Infantry (The Devils in Baggy Pants) of the 1st Airborne Battle Group until December 1958 when he was assigned to Mainz, Germany. He served there until 1961 when he was again assigned to Fort Bragg, North Carolina. He was selected for Ranger School and in 1964 was assigned to Mountain Ranger Camp for his first tour as a Ranger Instructor. He served with distinction teaching military mountaineering to Ranger Students and also North Georgia College Cadets. He assisted greatly with the Order of Colombo. This is when I first met Don Stafford. In 1968-1969 he deployed to Vietnam with the 101st Airborne Division. After his combat assignment with the 101st, he was sent to Vietnamese Language School and then back to Vietnam as a Ranger Advisor from 1970-1971. After a second combat tour, he returned to the Mt. Ranger Camp and served on the combat patrolling committee. He was selected as NCOIC of RM1R36N, the vehicular Ambush FTX . During this time I had the pleasure of again serving with Don Stafford. He trained thousands of Ranger students during his two tours at Camp Merrill. He was selected for the Sergeant Major Academy at Fort Bliss near El Paso TX. After serving as 1st Sergeant of the Honor Guard in Washington, D.C., he was selected for another assignment to Germany. 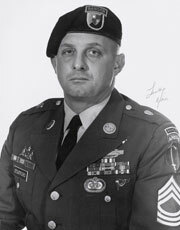 In 1982 he was assigned to Fort Benning, Georgia where he served with General Ed Scholes until he retired in January 1984. CSM Don Stafford was frequently described as the best soldier that they had ever known. I certainly echo that opinion. He was truly a soldier's soldier. The Silver Star; Legion of Merit, Bronze Star Medal with 2 Bronze Oak leaf Clusters and "V" device; Meritorious Service Medal with Oak Leaf Cluster; Air Medal: Army Commendation Medal with five Oak Leaf Clusters and "V" Device; Purple Heart with 1 Oak Leaf Cluster; Good Conduct Medal (8th Award); National Defense Service Medal; Vietnam Service Medal with 1 Silver Service Star and 1 Bronze Service Star; The NCO Professional Development Ribbon with numeral 5, Army Service Ribbon; Overseas Service Ribbon, Republic of Vietnam Campaign Medal; Combat Infantryman Badge, Master Parachutist Badge; Ranger Tab; Pathfinder Badge, Vietnamese Cross of Gallantry with Palm, (2nd Award); Vietnam Ranger Badge; Vietnamese Cross of Gallantry with Bronze and Silver Stars; Vietnamese Civil Actions Medal, German Army Marksmanship Badge in Bronze and 4 Overseas Service Bars. CSM Don Stafford was a great Ranger, and it is an honor to recognize him here today.